Nano470 Construction Glass Glue is the builder’s choice for a construction-strength adhesive bonding agent for projects of all sizes and scopes, including large load-bearing applications and glass furniture pieces. Perfect for hanging up glass shelving, creating glass wall separators and tables, and adhering glass to metal, Nano470 Construction Glass Glue does not require UV light to cure. This high-viscosity glue comes in an easy-to-use squeeze and pour 20g (0.7 oz.) bottle and cures easily using white fluorescent light, and can handle industrial-strength loads higher than most glass glue. If your job calls for glass glue that is 100% safe, weight bearing and won’t smudge, streak or leave marks, Nano470 Construction Glass Glue is the product of choice. 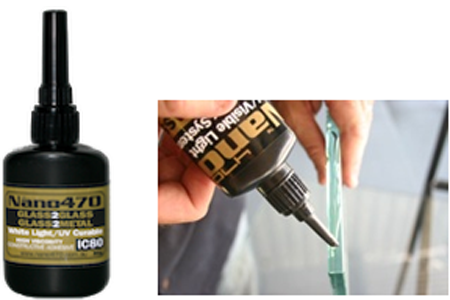 For projects that require more glue, Nano470 Construction Glass Glue is also available in 1Kg and 200G containers.